Yes, but adding to a long list of awards since the beginning of the plug-in “extended-range electric vegicle” Kelley Blue Book just named the outgoing model its 2015 Electric/Hybrid Car Best Buy. Despite being due for a major overhaul, the Chevrolet Volt is still capturing awards, like this latest “Best Buys of 2015: Electric/Hybrid” from Kelley Blue Book. Chevrolet’s Volt plug-in hybrid was born in crisis, coming to market not long after General Motors’ June 2009 bankruptcy. You’d expect the company would have learned a few lessons along the way. And it has, says CEO Mary Barra. You’ll see proof in January at Detroit’s auto show. Just like its Cruze platform mate, the first-generation Chevy Volt is nearing the end of its model cycle. And given that the all-new D2XX-based Volt is one to two model years away from reaching the market, General Motors is giving the 2015 Volt a handful of slight changes to keep it relatively fresh (not that it’s in any way outdated). With the plug-in hybrid segment is becoming more crowded and competitive, it appears as though Chevrolet is gearing up for battle. Reports suggest the automaker is planning a second and more affordable version of the next-gen 2016 Chevrolet Volt so that it could beat its rivals in both range and price. The 2014 Chevrolet Volt plug-in hybrid has one powertrain, but the redesigned model debuting in late 2015 will give buyers two choices, Edmunds has learned. The base model likely will carry a lower sticker price. The next-generation battery pack and electric motor will give the Volt a longer range. NEW YORK (TheStreet) — Extended-range electric cars: It’s a mouthful of a phrase. It also turns out to be the ideal compromise between the advantages of an electric car and the advantages of a gasoline engine car. “See the USA–in your Chevrolet” is the ancient jingle for Chevy’s 20th-century internal combustion engines. The Volt is looking to exceed 133,333 electric-only trips across the USA today, enough to walk the Great Wall of China 30,000 times, as GM’s Jeff Cobb puts it. The 2011 Volt ranked number one in the compact class of J.D. Powers 25th annual Vehicle Dependability rankings. This, it did while four cylinders gas cars have broke a streak and declined for the first time in over a decade, as you’ll see. “Our new car, the Super-Duper Electric 101, with 300 miles of range, is $39,999 and is shipping TODAY.” — Said no auto executive at a launch event, ever. volt-conceptThree years ago this month, GM launched the Chevy Volt as an “extended range electric vehicle, though most people refer to it as a plug-in hybrid. But the next-gen Chevy Volt really could be an EREV with up to 200 miles of range per charge, if soon-to-retire CEO Dan Akerson’s comments have any amount of truth to them. Dare we hope? Our friends over at Edmunds have a nifty little True Cost of Ownership calculator, and the results are giving our other friends over at GM-Volt.com something to cheer about. When you plug the numbers into Edmunds’s proprietary system, you come up with a five year cost of ownership for the Chevy Volt that is thousands less — yes, less, than the retail price. Chevy Volt Owners Drive More Electric Miles Than Nissan Leaf Drivers: Why? Is it a case of picking the right electric car for the right job? Or could a lack of “range anxiety” really lead drivers to cover more miles? It’s a kind of chicken-or-egg question, but it came to mind when our author Matthew Klippenstein sent us some data. Testing three leading plug-in hybrids — the Honda Accord, the Chevrolet Volt and the Ford Fusion Energi — feels like a glimpse into the future of driving. Vice President Chris Perry also says the auto maker’s large pickup inventories are swinging in favor of ’14 models and calls the new Chevy Corvette Stingray a no-excuses sports car. Competitive forces help motivate Chevy Volt price cut, GM says. Chevy Volt Plug-In Electric Cars Now Have Battery Cells Made In U.S.
Over the next few months, the Chevrolet Volt will get just that little bit more American–as its battery cells are now produced in the U.S.
Korean battery maker LG Chem opened a plant in Holland, Michigan two years ago, and production of lithium-ion cells for Chevy’s range-extended plug-in Volt is now finally underway. PORTLAND, OR – All things considered, Cristi Landy might have the toughest job at General Motors. As Chevrolet’s small- and electrified-car marketing chief, Landy must educate Americans about the Chevy Volt extended-range electric vehicle. It’s a task she readily admits might be greater than anyone at the auto maker anticipated when the car launched three years ago. 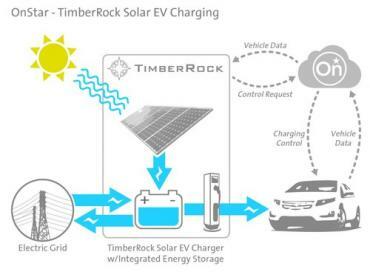 GM and TimberRock are developing support for an integrated solar power system, with grid energy storage and electric car charging, enabling smart grid goodness.